This covers primary and secondary schools, colleges, universities and student accommodation. It also encompasses nurseries and offices. This category covers GPs' surgeries, walk-in centres, offices and national hospital premises. This lot covers blue light buildings (ambulance, fire and rescue, police and prisons), town halls, civic centres, libraries, local authority buildings and offices. It also extends to sport halls and leisure centres. SBS has delivered a wide range of works through previous Fusion 21 frameworks. Examples have included (amongst others) interior refurbishments of social housing properties in Merseyside, and energy efficiency schemes in Flintshire, Shropshire and Suffolk. Currently, we are working with Fusion 21 on other frameworks including Void Repairs, Installation Retrofit & Associated Works (14 lots)and Whole House Refurbishment (11 lots). "We have a long history with Fusion 21," said company chair, Derek Horrocks, "so it's good to see that we're building on that with this latest framework success. The tender required evidence of our commitment to quality, safety and best value, and we showed that we've developed an excellent track record in all those respects. Now that we're on the framework, we'll be looking forward to using all our skills and experience to benefit Fusion 21 members across Britain." 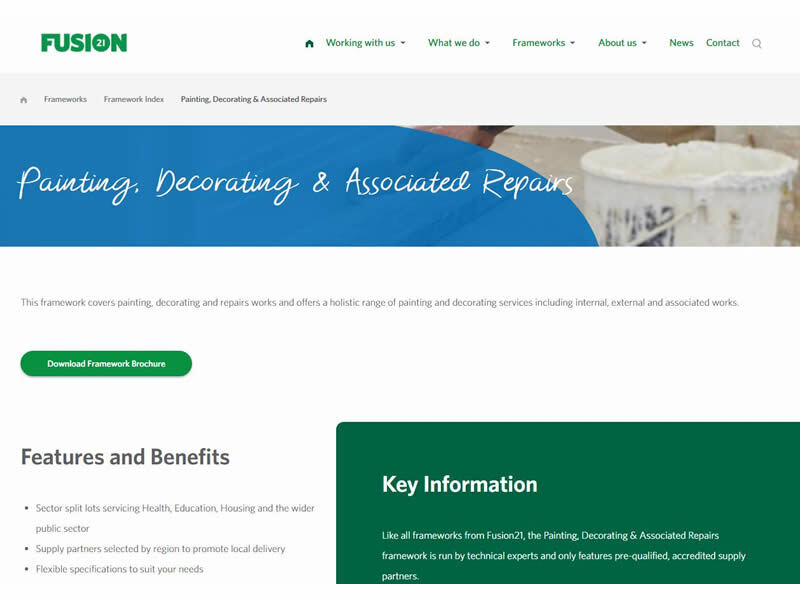 More details of the Fusion21 Painting, Decorating and Associated Repairs Framework can be found here.